USE AT YOUR OWN RISK. Handlers are legally responsible and liabile for the actions of their dog(s) at all times. Dog waste must be IMMEDIATELY cleaned up, carried and disposed of in a trash receptacle by the dog's handler. Large portions of this area are UNFENCED. Dogs(s) must be in sight and under voice control AT ALL TIMES. Trespassing onto private property by pets and/or handlers is prohibited. Limit of THREE (3) dogs per handler. Dogs must remain leashed at all times when outside the Dog Off-Leash Area. Handlers must carry one (1) leash per dog with them at all times. Agressive, sick or injured dogs, dogs in heat and puppies under four months old are prohibited. Dogs must have current vaccinations and proof of licensing on collar. No hunting, or discharging of firearms. Open carry of firearms is prohibited. All other Jefferson County Open Space and Animal Control rules and regulations apply. 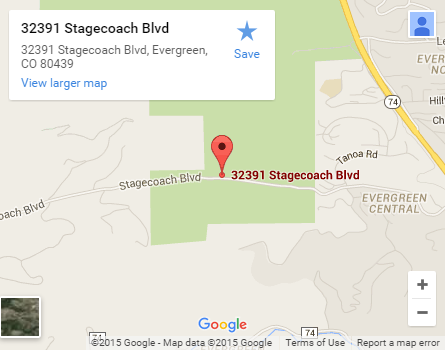 From State Highway 74, turn west on Stagecoach and proceed 1.25 miles to the south parking lot. Safety Advisory: Stagecoach Blvd is a busy, 40 mph county road. You are required to leash your dog in parking areas and as you cross the street. Use the marked crosswalk area and do not unleash your dog until you are in the dog park proper. Legal parking is extremely limited on evenings and weekends. Choosing to visit the Dog Off Leash Area during these peak times increases the likelihood you will need to park in undesignated areas, compromising safety for you and your pet.